For the second month in a row, ham radio response to a tornado disaster takes center stage in CQ, as we lead off with a report from Public Service Editor Richard Fisher, KI6SN, on the role of SATERN - the Salvation Army Team Emergency Radio Network - as part of the agency’s overall response to the massive tornado that struck Joplin, Missouri, in mid-May. Next, we’ve got Part 1 of our annual guide to new products introduced at Dayton, presented by New Products Editor John Wood, WV5J. This installment of our Hamvention® “Safari” covers radios and amplifiers; in September, we’ll preview antennas and accessories. 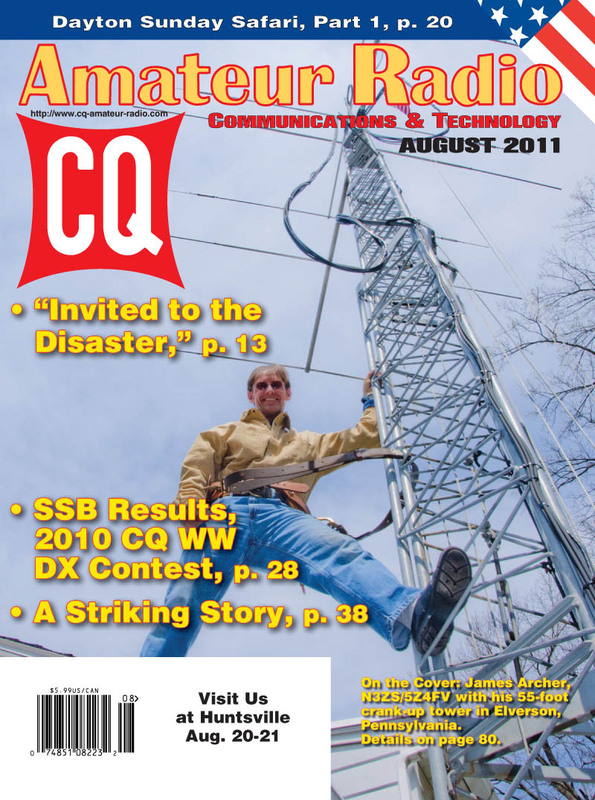 As always in August, we have the SSB results of the 2010 CQ WW DX Contest, with over 6500 logs received, 500 more than last year’s record, despite continuing low sunspot numbers. Here’s a preview of the worldwide winners in each major category: High Power All Band - CR2X (N5TJ op. ); Low Power All Band - HI3TEJ (bumping P40A after 5 years! ); QRP - KR2Q (with RX1CQ just 15 points behind! ); Assisted/High Power - ER0WW (UT5UDX op. ); Assisted/Low Power - YU2A; Multi-Single - D4C; Multi-Two - CN3A, and Multi-Multi - EF8R. Finally among our features this month, we have “A Striking Story,” in which Youth Editor KB1OGL shares her personal too-close-for-comfort encounter with lightning and the lessons she’s learned that can benefit us all. Our columns for August start out with Math’s Notes, in which WA2NDM looks at different types of isolation in various circuits; “Washington Readout” editor Fred Maia, W5YI, digs into the history of amateur radio licensing exams; “Learning Curve” editor Rich Arland, K7SZ, stays with the history theme, looking back at a century of homebrewing and kit-building in amateur radio; Kit-Building Editor Joe Eisenberg, K0NEB, checks out the new kits he found on display in Dayton, and QRP Editor Cam Hartford, N6GA, sticks with the building theme, interviewing prolific low-power kit designer Steve Weber, KD1JV and looking at some of the newest kits of interest to QRPers. 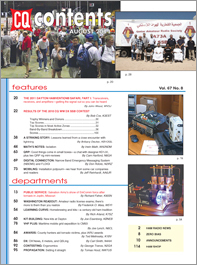 Digital Editor Don Rotolo, N2IRZ, looks at the use of NBEMS (Narrow Band Emergency Messaging System) and FLDIGI in public service and emergency communications; Mobiling Editor Jeff Reinhardt, AA6JR, brings us up to date on installation advice he’s collected from various automakers, and “VHF Plus” editor Joe Lynch, N6CL, reports on an ocean-going grid DXpedition to the very watery grid CM93. Awards Editor Ted Melinosky, K1BV, looks at awards from the International Amateur Radio Union, or IARU (there’s more than Worked All Continents!) and how county hunters helped some of their own after the tornadoes in the southeast; DX Editor Carl Smith, N4AA, brings us a potpourri of DX news, six-meter opportunities and a commentary on Logbook of the World vs. traditional QSLing; Contesting Editor George Tranos, N2GA, looks at ergonomics in your ham-shack layout, and Propagation Editor Tomas Hood, NW7US, sets out to “set it straight” on the latest gloomy propagation forecasts from the so-called experts. That's a brief look at what's coming up in the August issue of CQ magazine, which should be on newsstands and in subscribers' mailboxes by late June. 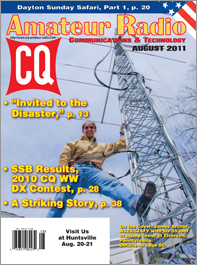 For information on becoming a CQ subscriber, click here! On the Cover: James Archer, N3ZS/5Z4FV, of Elverson, Pennsylvania, stepping onto his 55-foot tower.